There’s a lot more to Wisconsin than its fabulous cheese and Green Bay Packers football team. The Badger State’s Fox Cities area is truly one of the best kept secrets on the planet. Take your pick from supper clubs or golf clubs, performing arts, or a walk in the park, this area two hours north of Madison and Milwaukee should be on everyone’s bucket list. One of the state’s fastest growing areas with an estimated 250,000 residents, the Fox Cities is made up of 19 communities along the Fox River in east central Wisconsin, about 30 miles south of Green Bay. The area is recognized as having some of the best urban shopping options in Wisconsin. A visit here should include a trip to the Fox River Mall which features more than 180 retailers and dining options, including the Fox River Brewing Company. For those visiting in an RV, the village of Sherwood is home to High Cliff State Park, the only state-owned recreational area on Lake Winnebago, Wisconsin’s largest lake. The park gets its name from the limestone cliff of the Niagara Escarpment, which parallels the eastern shore of Lake Winnebago. A magnificent 12-foot statue of Winnebago Indian Chief Red Bird, standing on a huge granite rock, overlooks the lake and is a popular destination in the park. Nearby is a 40-foot observation tower where, on a clear day, you can view Lambeau Field in Green Bay. High Cliff State Park, which is open year round, offers 142 sites and can accommodate big rigs and pull throughs. The quiet picturesque setting also features 50 amp electrical, restrooms, showers, a marina, and the General Store Museum – a historical look back on the surrounding area. Adjacent to the state park is High Cliff Public Golf Course. This, par 71, 18-hole layout was designed in 1968 by Homer Fieldhouse. Playing at 6,188 yards from the blue tees, High Cliff Public Golf Course was built along the picturesque Niagara Escarpment which overlooks the majestic Lake Winnebago and High Cliff State Park. Don’t miss the variety of food and drink options at the High Cliff Restaurant which features everything from appetizers to entrees. Friday Fish Fry is a big deal throughout Wisconsin. At High Cliff Restaurant you can choose from haddock, pike, perch, and sometimes walleye, all prepared in a variety of ways; deep fried, pan fried, or broiled. Another eatery that is popular with visitors and locals alike is Frank’s Pizza Palace, a local institution since 1955 that dishes up Appleton’s best thin crust pizza. An authentic Wisconsin supper club experience is available at Mark’s East Side, a family-owned establishment since 1967. Featuring steaks and seafood and fine German fare, Mark’s East Side offers the quintessential Wisconsin supper club experience. You don’t just try cheese in Wisconsin, you experience cheese in Wisconsin. 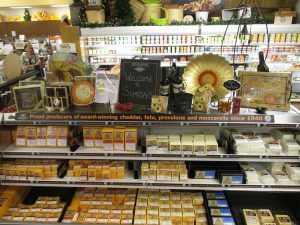 Simon’s Specialty Cheese in Appleton is a great place to explore a wide variety of cheese offerings. Simon’s has been serving the community and far reaches of the Midwest since the 1940s. Try the cheese curds, mozzarella whips, or signature specialties like their chocolate cheese fudge or three-year extra sharp cheddar. Cultural opportunities abound throughout the area, with the Fox Cities Performing Arts Center taking center stage since opening its doors 15 years ago. With a seating capacity of 2,100, the performing arts center houses an impressive 5,000 square foot stage, the second largest in the state. Hosting more than 350 events annually, the Fox Cities Performing Arts Center offerings include the best of Broadway, a cultural enrichment series, a daytime education series, community engagement experiences, and commercial programming that engages the broader community. Lawrence University in Appleton is a residential liberal arts college and conservatory of music. Annually, they host an annual artist series which brings to town some of best musicians in the world. To get a quick overview of the city where Harry Houdini called home, try a pedal-powered city tour on the unique Social Station. 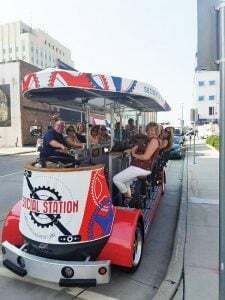 The Social Station is a four-wheel, 15-person mega-cycle that offers a unique and eco-friendly way to experience the city of Appleton. The greater Fox Cities area has much to offer year-round. For a closer look at this classy Midwest area in Wisconsin, visit FoxCities.com. Rick Stedman is an avid golfer, RVer, and writer who lives in Olympia, Washington. Rick writes a weekly golf blog, “The 19th Hole” for RV Life. You can reach him at rstedman@gmail.com.